I've been invited, no wait, summoned by my son's nursery to attend a meeting with the Manager and Deputy Manager regarding his behaviour. This in itself is pretty humiliating because I have no control over how he behaves at nursery and if he's anything like he is at home I know he can be a little Dr Jekyll and Mr Hyde. 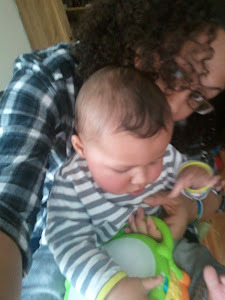 It's exhausting and it's very difficult to know how to handle him. Is he just an average two year-old throwing tantrums when he doesn't get his own way? His favourite behavioural faux pas at the moment are to hit, bite, scratch, pull hair, throw toys, push and apparently yesterday he said the 'f' word! I would like to add at this point that I'm pretty certain he didn't copy any of those from me! To add to my humilation I told the staff at nursery this morning to watch for his swearing and they were horrified, "We can't have the other children repeating that!" Yes, I know. That's why I told you. Apparantly, he runs around the room at nursery shouting, "BANG TIDY!" For those who don't know who Keith Lemon is just know it's not something a toddler should be saying. I'll admit, it was funny at first, but thanks to someone I know and their text alert noise, that phrase is very well fixed into my son's limited vocabulary. Other toddler behaviour which I am still becoming accustomed to is bottom scratching, 'Wilbur' tugging, drinking bath water and urinating standing up (he's really not ready). A prime example of this was earlier this evening as I was running his bath he stood next to me, peered into the bath and peed on my leg like a dog. They say that with behaviour like this you should distract them with something else rather than draw attention to it. I'm getting very good at saying, "Let's see what toys we can find to play with", through gritted teeth. 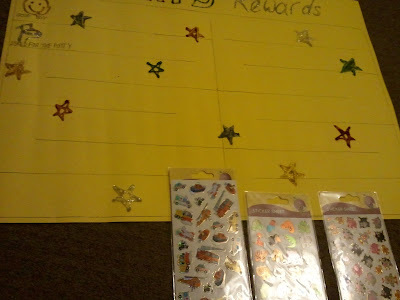 One of the nursery staff last week suggested I start a sticker reward chart for him. At the weekend I bought some yellow card, stickers and some glitter glue. Tonight I have realised how surprisingly difficult it is to draw a star using glitter glue and I never thought I would be drawing around a (badly drawn) picture of a toilet with a silver glitter pen. Still, I think it looks pretty effective. I've decided he must collect stickers either by being a good boy for the day or by asking for the toilet in time. When he has five in either row I will read him one of the new books I have bought him. He loves books and he loves it even more when I put on silly voices (yes, it has to be done) so I really don't know which of us will be more excited about him achieving a sticker. Probably me. He sounds like a normal toddler to me..just trying to push the limits. This phase will pass in time. Thanks Anon, I really hope you're right! We'll see what kind of a grilling I get at the nursery meeting in a few days time. Believe me it is a phase...my went through a phase of peeing like a dog in the garden...thankfully they have now stopped this...it's normal toddler behaviour ...learning what is right and wrong in life I'm sure if we talk to our parents they will tell you we went through the same.